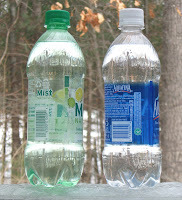 Trashpaddler's Waterway Wanderings: Massachusetts Bottle Bill and Common "Cents"
The 2 containers pictured at left are identical in their composition. Each contains 20-ounces of liquid and in some of our country's more progressive states each is assigned a monetary value of 5-cents so that, once empty, they have a better chance of being recycled. States such as Connecticut, Maine, New York, Oregon, California, and Hawaii understand this concept. Unfortunately, our Commonwealth of Massachusetts does not and stubbornly refuses to assign these equal containers an equal value. Our state assigns 5-cents value to the one containing carbonated water and no value to the one containing non-carbonated water. Back in the last century (1983), there may have been some logic behind this inequality. But now, 28 years later, I cannot think of any logic that would justify continuing with this system. After all, the word "sustainable" was only in its infancy back then. So here in the once progressive Commonwealth of Massachusetts, the manufacturers, retailers, and some consumers see no problem with this out-dated arrangement. Thus many of the more influential politicians see nothing to be gained by rocking the boat. I’ll grant them that it is convenient to just throw these containers out and hope for the best. The containers will either be recycled, incinerated, or buried. But given any serious thought, this seems absurd. We are manufacturing trash. Manufacturing these plastic single-use containers requires considerable resources such as: petro-chemicals for the plastic, water and electricity used in the manufacturing process, fuel to transport to market, and refrigeration to keep the containers ice cold in the store. When you add all this up, for just 20-ounces of liquid, how can it not seem wasteful? Do we really need to create tons and tons of polyethelene terephthalates? Would this be considered “sustainable”? Not to my way of thinking. This legislative year holds hope, as it has perennially, that this might be the year the bottle bill is revisited and updated. In these tough econonmic times, the state could realize millions of additional revenue resulting from unclaimed deposits. Opponents of an expanded bottle bill argue that it is a tax (on the lazy) and that since many folks have access to curbside recycling programs, a bottle bill is no longer necessary. While there is some truth to this, the problem is the single-use containers people purchase and consume while away from home and on-the-run that, all too often, find their way into the environment. It's funny to hear expanded bottle bill opponents begrudgenly admit to how successful the original bottle bill was. It was an environmental measure that delivered all that was promised back when beer and soda were the beverages of choice. If common "cents" prevails and the bottle bill is revisited, I hope the flimsy plastic wrappers identifying the container as redeemable will be replaced with something more durable. The glue holding the ends of the wrapper together seems to dissolve when wet. This results in many of the containers recovered from waterways being deemed worthless. Of course not everyone is sitting around and waiting for the day when logic might prevail. In the Town of Concord, Massachusetts, resident Jean Hill is, once again, providing citizens an opportunity to go even further in bucking the trend and banning the sale of single-use plastic water bottles outright. Last year, Hill proposed a similar article and it was passed at Town Meeting. However, the article was flawed in its wording and deemed unenforceable by the Town. Undeterred, Hill has re-crafted the bill in such a way that it should pass muster, this time, if adopted at Town Meeting. If so, perhaps other communities would examine the issue and adopt similar measures. The bottled water industry should be concerned that Hill's proposal seems to have found solid traction. I find her arguments compelling and hope she is successful. Perhaps my town, Acton, could be the one that seconds the notion. So, what do you think? 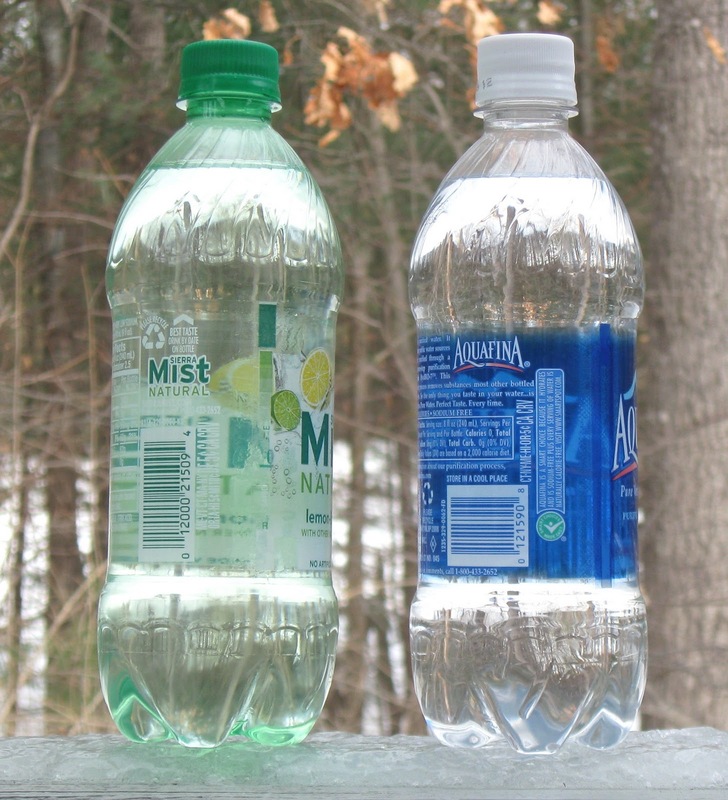 Did the original bottle bill make sense? Does it need to be updated to include the variety of non-carbonated drinks that are now popular? Is it too much of a hassle? Is it a tax? Does giving an empty container 5-cents value create enough incentive for someone to redeem it or not discard it? Do you care if these plastic containers end up in the environment? Is sustainable the same as good old fashioned common sense? Yes, it's open water. 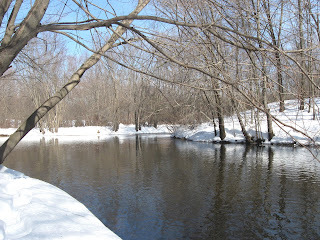 The Sudbury River in Framingham to be exact. Give me just a few more degrees of warmth and my boat and I will once again be afloat! Plastic water bottles and sports-drink bottles make up the majority of the plastic litter I now find, and I hope an expanded bottle bill helps curb this.